S&P500 index is traded with an increase: support was provided by macroeconomic statistics. Published yesterday, the "Beige Book" showed the growth of the US economy. Producer Price Index showed a slight decrease reaching 2.3% YoY. Investors also focused on news that the US could hold another round of talks with China to avoid further growth of duties and trade war. One of the leaders of growth was the shares of tobacco companies - after the publication of the Food and Drug Administration (FDA) report about electronic cigarettes that can also harm health, and their distribution among young people is "epidemic". Perhaps in the future, some restrictive measures will be taken against this. Today, important news on interest rates of the ECB, as well as the level of inflation in the US will be published. Stochastic is at 70 points and does not provide a signal for the opening of positions. 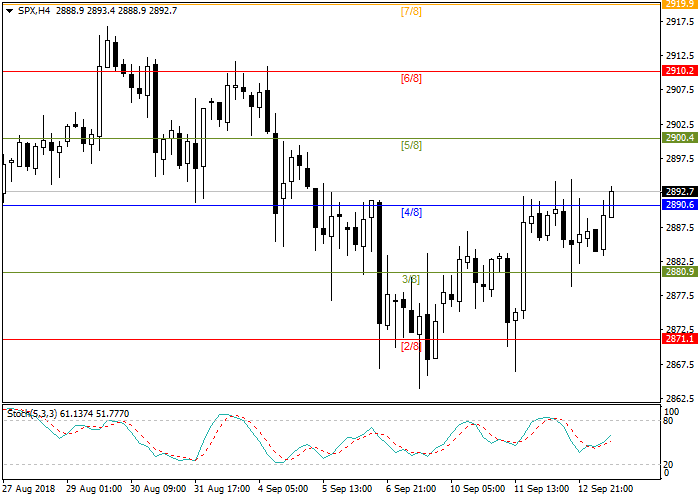 Long positions may be opened from the current level with take profit at 2900.4 and stop loss at 2882.5.